Why baseboard trims can't be also used as door moldings in rooms? 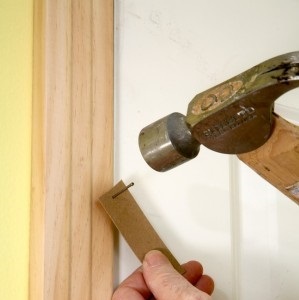 For example, floor molding of size 1/2" x 3-1/4" would perfectly fit as door molding. 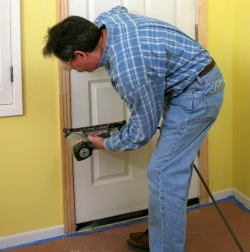 Are there special requirements for door casings that don't allow use the floor moldings? There's no reason it can't, and my own home is an example, having stained oak base trim around all openings as well as against the floor. I can't say I like it much, and when I update the trim I'll do away with the style, but it's not terrible. However, base trim is usually thinner than casing. This prevents "flush joints" from occurring where base and casing meet. 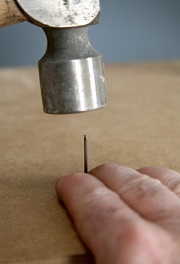 In carpentry, flush joints are to be avoided because it's difficult to achieve perfect alignment in the field. By using a thicker casing, the problem is eliminated. Casing usually has more detail to it, making it more visually interesting. By having different styles for base and casing there's a visual separation. It may look odd to see a continuous run of trim along the wall and over a door unless an ultra-modern style is desired. 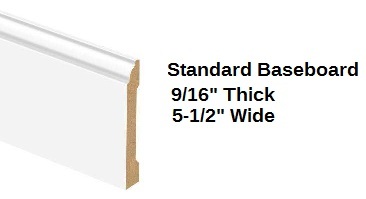 Base trim is also typically taller than casing. If the same molding is used on windows it can result in a top-heavy appearance. This is a matter of personal taste, of course. Door casing also looks nicer because the design places the focus inward toward the door, as opposed to the plain flat look of floor molding. Standard Zamma Base Molding is about 9/16" thick. Standard Woodgrain Millwork Door Casing can be as thick as 11/16" and Fypon Door Casing which is a very modern look and is an inch thick. Therefore, using baseboard means you will have the same thickness on the floor and around the door, which will look strange. If you are using a pre-painted baseboard; the bottom of the trim is usually not finished because that side is meant to be against the flooring. When you use it as door trim, the bottom would be facing outward. MDF doesn't accept paint very well so you will have to use a primer. After you apply your trim paint, the outside edge will appear different. You would also have to sand it to make it as sooth as the face of the trim will be. Can you use it? Of course. It's your home. I wouldn't suggest it. Most people that go this route eventually change it. Trim usage is definitely open to a matter of owner/user taste. Just the opposite of what you asked in your question the contractors that built my house some 30+ years ago used a door casing style trim for door casing, window casing, baseboard around carpeted areas and even as the edge trim around the top of stub walls that are finished like a shelf. As time goes by and carpet or other flooring gets replaced I an replacing with a more standard baseboard. Not the answer you're looking for? Browse other questions tagged trim baseboard or ask your own question. Safe way to close gaps around copper pipes? What kind of paint do I need for baseboards? 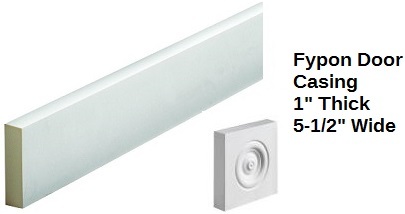 How to install floor baseboard on drywall frame with metal studs?